Cerambycidae are among the more important economic insects, annually causing tens of millions of dollars damage to forest wood products worldwide. A knowledge of faunal compositions, and an understanding of species biologies are essential to successful tropical silvicultural and forestry programs. Further, cerambycid beetles are highly diversified taxonomically and ecologically, and are closely-allied to their host plants; as such they may provide important data and evolutionary "clues" for ecological and zoogeographic studies. There is no recent catalog or checklist of Cerambycidae for Madagascar. Some taxonomic groups have been treated fairly recently (Parandrinae and Prioninae by Quentin and Villiers in 1975; Lamiinae by Breuning in 1954, 1957, 1958, 1959, 1961, 1964, 1966, 1968, 1971, 1975, 1980a, and 1980b) but other large groups, such as Cerambycinae and Lepturinae have not been recently treated. This is particularly significant for Lepturinae, because this subfamily, although almost completely absent from continental Africa, forms a significant component of the Malagasy fauna. The area under consideration for this checklist includes all of the nearby offshore islands, such as Europa Island, Nosy-Be Island, and Sainte-Marie Island, as well as more distant island groups, such as the Comoro Islands and Seychelles. Adlbuer, K. 1994. Frea viossati, eine neue Crossotini-Art von den Komoren und Bemerkungen zu einer weiteren Art dieser Tribus aus Madagaskar. Aurivillius, C. 1912. Coleopterorum Catalogus. pars 39, Cerambycidae: Cerambycinae. Berlin, W. Junk, 574 pp. -----. 1922. 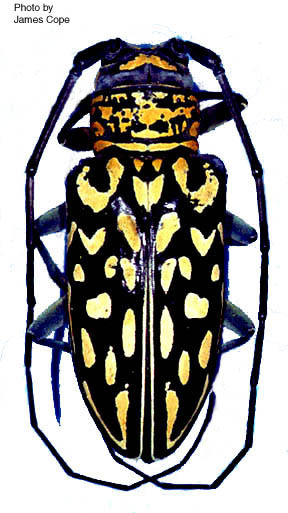 Coleoptera (Cerambycidae) from the Seychelles Islands, Aldabra, and Rodriguez. Ann. Mag. Nat. Hist., Ser. 9, Vol. X, pp. 421-443. -----. 1922. Coleopterorum Catalogus. pars 73, Carambycidae: Lamiinae. 1. Berlin, W. Junk, 322 pp. -----. 1923. Coleopterorum Catalogus. pars 74, Carambycidae: Lamiinae. II. Berlin, W. Junk, p. 323-704. Breuning, S. von. 1954. Description d'un Lamiinae nouveau de Madagascar. Bull. Soc. ent. Fr., p. 114. -----. 1957. Coleopteres Cerambycides Lamiinae. Faune de Madagascar, IV, pp. 1-401. -----. 1960. Lamiaires de Madagascar. Verh. naturf. Ges. Basel LXXI, pp. 223-226. -----. 1964. Nouveaux Lamiaires de Madagascar. Bull. Soc. ent. Mulhouse, pp. 23-27. -----. 1966. Cerambycides nouveaux de Madagascar [Col.]. Bull. Soc. ent. Fr., LXXI, pp. 126-131. -----. 1975. Contribution a l'etude des Cerambycides Lamiinae du massif de l'Andringitra, Madagascar Centr. Bull. Soc. ent. Fr., LXXX, pp. 258-265. -----. 1980a. Diagnoses preliminaires de nouveaux Lamiinae de Madagascar. Rev. fr. Ent., (N.S. ), 2(1), pp. 29-41. -----. 1980b. Nouvelle espece de Lamiinae des Iles Seychelles. Bull. Soc. ent. Mulhouse, p. 50. Breuning, S. and A. Villiers. 1958. Nouveaux genres de Cerambycinae de la region malgache. Rev. fr. d'Ent., XXV, pp. 221-232. (nouv. ser.). XXXV, pp. 45-57. -----. 1968. Les Cerambycides de Madagascar. Revision des Cerambycinae Glaucytini. Ann. Soc. ent. Fr., (N.S. ), 4(1):pp. 45-67. Fairmaire, L. 1889. Diagnoses de Coleopteres Madecasses. Annls Soc. ent. Belg. XXXIII, pp. 90-96. Lameere, A.A. 1913. Coleopterorum Catalogus, pars 52, Cerambycidae: Prioninae. Berlin, W. Junk, 108 pp. Lepesme, P. and A. Villiers. 1944. Note sur quelques Crossotini malgaches [Col. Cerambycidae]. Bull. Soc. ent. Fr. XLIV:74-79. -----. 1956. Revision des genres du groupe Metallyra Thoms (Coleoptera, Cerambycidae). Rev. Zool. Bot. Afr. LIII (1-2):208-225. Quentin, R.M. and A. Villiers. 1970. Revision des Dorcasomini [Col. Cerambycidae]. Annls Soc. Ent. Fr. (N.S. ), 6(1):25-34. -----. 1975. Faune de Madagascar, 40, Insectes, Coleopteres Cerambycidae, Parandrinae et Prioninae. ORSTOM, Paris. 251 pp. -----. 1977. Genera et Catalogue raisonne des Prioninae africains. I. Ergatini (Col. Cerambycidae). Annls Soc. ent. Fr. (N.S. ), 13(3):509-524. -----. 1978. Genera et Catalogue raisonne des Prioninae africains. II. Macrotomini (Col. Cerambycidae). Annls Soc. ent. Fr. (N.S. ), 14(2):207-274. Villiers, A. 1980. Faune de Madagascar, 52, Insectes, Coleopteres Cerambycidae, Disteniinae. ORSTOM, Paris. 133 pp. -----. 1982. Demembrement du genre Mastododera Thomson (Coleoptera, Cerambycidae). Annls Soc. ent. Fr. (N.S. ), 18(1):129-162.